Top 2018-19 Preseason Storylines - College Hockey, Inc.
What to watch as the puck drops on the new season. Minnesota Duluth’s Scott Perunovich is one of 15 returning All-Americans around Division I in 2018-19. The NCAA Division I men's hockey season opens Oct. 6 as the race to Buffalo and the 2019 Frozen Four kicks off with 14 regular-season games and 27 exhibitions on the weekend. College hockey enters 2018-19 enjoying an era of tremendous parity and success in developing players for the professional ranks. Below are some of the top storylines and elite performers to watch as the season gets underway. Player profiles … Ohio State forwards Mason Jobst (undrafted) and Tanner Laczynski (PHI pick) have each earned All-America honors the past two years and led the Buckeyes to the 2018 Frozen Four. They are back for their senior and junior years, respectively, and have OSU as the preseason favorites to win their first Big Ten title. Anybody's game – More than half of all Division I teams have made the 16-team NCAA tournament in the last five years (33), with 14 schools making at least one Frozen Four appearance in that time. Three of the last six champions were the last team to earn an at-large berth in the field, including Minnesota Duluth last season. Seven schools have won the last seven NCAA championships as UMD begins its quest to become the first repeat champions since Denver in 2004 and '05. Player profile … Scott Perunovich led UMD in scoring as a freshman, headlining a defense corps that returns intact for the defending national champions. In fact, Perunovich was one of five freshmen defensemen for UMD last season. Did you know? … Seven of the top 16 teams in the USCHO.com preseason poll have never won a national championship. Player profiles … Princeton's current seniors won five games as freshmen (5-23-3), but have led a turnaround to an ECAC Tournament title and NCAA Tournament appearance last year. The group – which includes NHL free agent candidates Max Véronneau, Ryan Kuffner and Josh Teves – returns to complete their degrees and to lead a program that is still seeking its first regular-season ECAC Hockey title and its first NCAA Tournament victory. New leaders – Eight programs have new head coaches in 2018-19, including Boston University and Denver, whose previous leaders took NHL head coaching jobs. Of the seven schools to win five or more NCAA championships, only Boston College (Jerry York) has a coach who has been in place more than three years entering the season. Coach profiles … Former assistant coaches and alumni at Boston University (Albie O'Connell), Denver (David Carle) and New Hampshire (Mike Souza) take over their programs in 2018-19. Carle, who turns 29 on Nov. 9, is the youngest head coach in Division I. Did you know? … Only two of the eight new head coaches have previous head coaching experience (Scott Borek, Bob Motzko). Developing D – This season could be the year of defensemen in college hockey, as all four first-team All-American blueliners are back for the first time ever: Northeastern's Jeremy Davies, Harvard's Adam Fox, Minnesota Duluth's Scott Perunovich and St. Cloud State's Jimmy Schuldt. In addition to that group are two of the world's top four NHL prospects among defensemen according to The Athletic's Corey Pronman in Quinn Hughes (Michigan) and Cale Makar (Massachusetts). They are joined by fellow first-round NHL Draft picks Dante Fabbro (Boston University), K'Andre Miller (Wisconsin) and Jacob Bernard-Docker (North Dakota). Sixteen of the top 25 scoring defensemen from 2017-18 are back this season. Player profile … Adam Fox was traded in the offseason – his rights went from Calgary to Carolina – but he returns to Harvard as a junior, the first returning two-time first-team All-American in college hockey since Brian Gionta (1999-2000). Did you know? … Each of the last six NHL All-Rookie defensemen – and 10 of the last 14 – played NCAA hockey. Player profile … Jimmy Schuldt was one of the nation's most coveted free agents a year ago as he captained St. Cloud State to the NCHC title. He surprised everyone – including his new coach, Brett Larson – when he decided to return for his senior year and try to lead the Huskies to even greater heights in 2018-19. Young guns – Two freshmen have been named first-team All-Americans each of the past two seasons, as rookies are entering college ready to make an impact like never before. 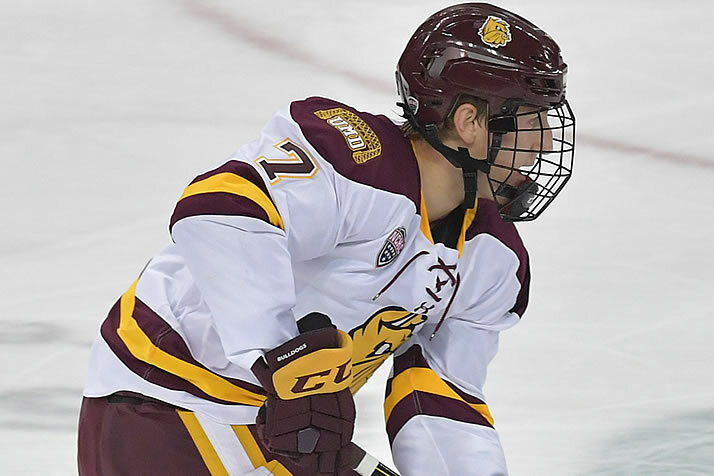 Newcomer Scott Perunovich led Minnesota Duluth in scoring last year as the Bulldogs captured the national title, the second time in three years that a freshman led the national champs in scoring (joining Brock Boeser, 2016). Some extremely talented newcomers come to campus this fall, led by first-round draft picks Oliver Wahlstrom (Boston College), Joel Farabee (Boston University) and Jay O'Brien (Providence). Player profiles … Brothers Anthony and Marc Del Gazio join Massachusetts as freshmen this year after each earning All-USHL honors last year for the Muskegon Lumberjacks. They headline another impressive freshman class for the Minutemen, whose top five scorers a year ago were all freshmen. First things first – Thirteen NHL first-round draft picks will play in the NCAA ranks this season, leading nearly 200 NHL draft picks on college rosters. All 31 NHL teams have prospects in the college game, while 43 NCAA rosters feature at least one NHL draft pick. Did you know? … 24 NCAA players have been selected in the first round of the last three NHL Drafts, the same number as the previous six drafts combined. Player profiles … Four of the 13 first-round draft picks in college play at Boston University: Shane Bowers, Dante Fabbro, Joel Farabee and Jake Oettinger. Show stoppers – Eight of the top 10 goaltenders in save percentage last year return in 2018-19. That group includes national champion Hunter Shepard (Minnesota Duluth) and Mike Richter Award winner Cale Morris (Notre Dame). Player profiles … Matthew Galajda and Cale Morris had a combined 20 minutes of NCAA experience entering last season, but they wound up being first-team All-Americans. Now with a year under their belts, they return to lead Cornell and Notre Dame, respectively. Did you know? … A record 27 former NCAA goaltenders appeared in the NHL in 2017-18.
Who takes home the Hobey? – Four of the 10 finalists for the 2018 Hobey Baker Award return in 2018-19: forward Dylan McLaughlin (Canisius), defenseman Jimmy Schuldt (St. Cloud State) and goaltenders Matthew Galajda (Cornell) and Cale Morris (Notre Dame). Player profile … A Buffalo native, Dylan McLaughlin has had a front-row seat to the redevelopment of his city led by Buffalo Sabres owner Terry Pegula, and he currently stars for Canisius in Pegula's HarborCenter arena. McLaughlin and Notre Dame's Cale Morris are the two conference players of the year back from last year, and he ranks fourth among active players in career points (107). He hopes to lead Canisius to the NCAA Tournament for the first time since 2013. Rich bloodlines – NCAA rosters feature sons of NHL owners, coaches and Hockey Hall of Famers, plus dozens of NHL alumni. Player profiles … San Jose and Vegas are two of the favorites in NHL's Pacific Division; meanwhile, the sons of San Jose head coach Peter DeBoer (Jack) and Vegas general manager George McPhee (Graham) will compete in one of college hockey's best rivalries. Jack is a freshman at Boston University while Graham was Boston College's second-leading goal scorer last year and returns for his junior year. International game – NCAA hockey features talent from around the globe, including a growing European influence. A record 96 Europeans played Division I men's college hockey last season, a number that could top 100 in 2018-19. Last year's rosters also featured what are believed to be the first two Japanese-born and trained players, while this year Cornell's Misha Song is believed to be the first Chinese-born and trained player in Division I. Player profile … Minnesota State junior Marc Michaelis is a two-time first-team All-WCHA selection who has represented Germany in the World Junior Championship (2015) and the World Championship (2018). He is the top returner for a Maverick team picked to repeat as WCHA regular-season champs. Smart guys – The talent U.S. college hockey players display on the rink is matched by their performance in the classroom. Hockey is among the very best NCAA Division I men's sports in the NCAA's two biggest academic metrics – the Graduation Success Rate (90%) and Academic Progress Rate. A number of NHLers have worked to complete their degrees after leaving campus as well. Recently Alec Martinez (Miami), Torey Krug (Michigan State), Colton Parayko (Alaska) and David Backes (Minnesota State) have joined the ranks of graduates. Player profile: Air Force forward Kyle Haak enters his senior season with 64 career points and even more impressive numbers in the classroom. The physics major with a minor in nuclear weapons and strategy is the No. 1-ranked cadet at the Air Force Academy in academic performance. He was named both the Air Force Association Cadet of the Year and the U.S. Air Force Cadet of the Year for 2018.